LATISSE® can be easily obtained by the medical staff at Laser Aesthetics. Make an appointment for more info at one of our locations serving Ancaster. LATISSE® is a prescription product that grows your eyelashes longer, fuller and darker. How Do I Use LATISSE®? Apply nightly directly to the skin of the upper eyelid margin at the base of the eyelashes using the accompanying applicators. 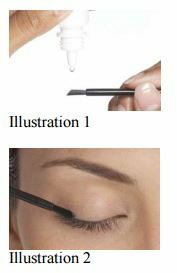 Blot any excess solution beyond the eyelid margin. Dispose of the applicator after one use. Repeat for the opposite eyelid margin using a new sterile applicator. Q: Is LATISSE® right for me? Q: What can I expect from LATISSE®? Q: How does LATISSE® work? Q: Is there anything else I need to know about LATISSE®? Ancaster client, book your LATISSE® treatment consultation. Does Brooke Shields really use LATISSE®? Yes. Brooke Shields has been using LATISSE®. Have the Staff at Laser Aesthetics, or have any patients of Laser Aesthetics, used LATISSE®? Yes. Several of the staff at Laser Aesthetics have been using LATISSE®. Click Here to get LATISSE® at our Hamilton location, serving Ancaster clients.